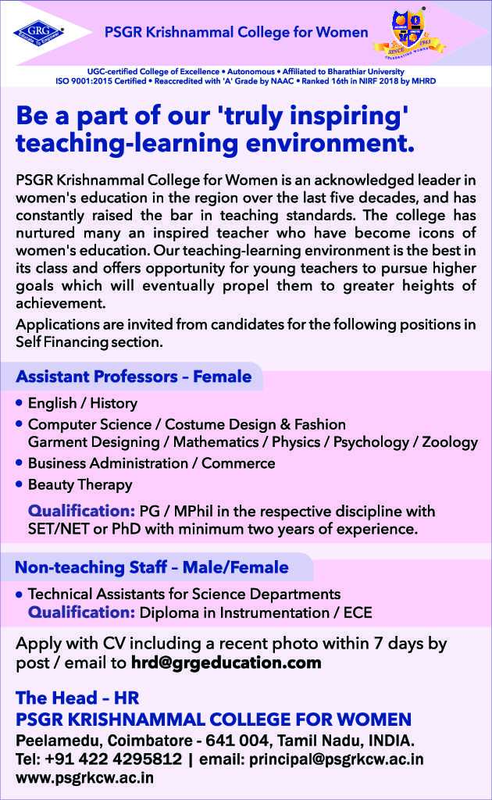 PSGR Krishnammal College for Women, Coimbatore has advertised in THE HINDU newspaper for recruitment of Assistant Professor / Technical Assistants jobs vacancies. Interested and eligible job aspirants are requested to apply within 07 days from 10th April 2019. Check out further more details below. About College: The PSGR Krishnammal College for Women was established on 28th June 1963, by Sri.G.R.Govindarajulu and Smt.G.Chandrakanthi. It was inaugurated by the then Chief Minister of Tamilnadu, Sri.Bakthavatchalam. It caters to the needs of women in higher education. The College is autonomous, ISO 9001:2008 certified and Re-accredited with A GRADE by NAAC (National Accreditation and Assessment Council). How to Apply: Interested and eligible candidates are requested to send their CV along with copies of certificates and recent PP size photo to the postal address or email address provided below.